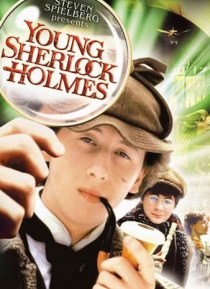 What would have happened if Sherlock Holmes and Dr. Watson had met as schoolboys? Why, the solution is elementary. Nothing but adventure! And that's just what executive producer Steven Spielberg gives us in this special effects spectacular that sends the super sleuth on is very first case! When a plague of bizarre, puzzling murders grips London, young Holmes and his newfound friend Watson find the… mselves unwittingly entangled in the dark mystery. So, "the game is afoot!" And the budding detective is off on an adventure to solve the most amazing case of his most extraordinary career.